The price of gas getting you down and making you re-think those long drives to the Oregon Coast? Get the same amenities and satisfaction just two hours from Seattle, where the revitalized former fishing town of Westport offers long, sandy beaches and stunning sunsets that take your breath away. Our one-bedroom condo is just steps away from 18 miles of pristine coastline, where morning strolls collecting sand dollars and evening walks with the sun setting over the Pacific offer a memorable respite from the current woes you read about every day. The condo is specifically appointed to make you feel like it's a home away from home, with a huge bay window overlooking blowing dune grass and the sound of waves crashing on the beach. You can fly kites, build sand castles or get away for a romantic weekend. We do have WiFi in the unit. There is also internet service available in the clubhouse from 9 a.m.-4 p.m. Sunday-Thursday and 9 a.m.-6 p.m. Friday-Saturday. A full workout room in the clubhouse, which is about 100 yards away from the unit. 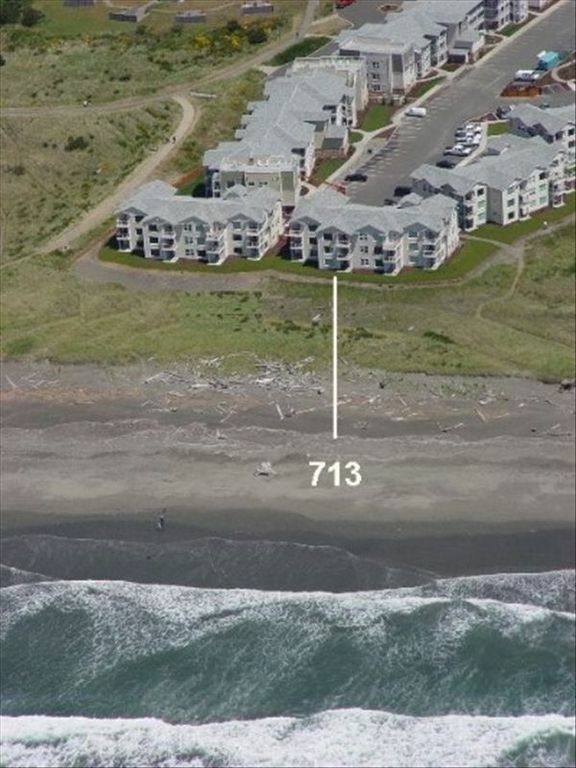 This is a great condo right on the beach. Beautiful view from the main living area! Well appointed kitchen and very clean. Would definitely stay here again! The place is right down the road from the Lighthouse on Ocean Avenue, Grocery store is less than a half mile away. Its fairly quiet (Summer might be a different story... but..). For a one bedroom, it is large - and comfy. The bed is firm. FYI. (Little too firm for my liking) - Trail to the beach is right out the front door. There are hoses on the north and south sides to wash off the sand from you or your pup. Nice easy, fairly flat bike trail all the way to the tip of town - with lots of benches to stop and take in the views or have a picnic. It is RIGHT on the water - so if you want the sounds of the waves, this is the place. It has all the utensils you need for cooking, there is a fold out couch facing the beach. Nice little covered porch on the back to sit a stare. You can lock your bike up on the covered front porch. just remember this is the beach and moisture is just part of the package. The only challenge might be parking. At the end of the complex there are a lot of units, so parking does get stacked up. for this end unit though - there is a load and unload only area that helps to get all your stuff out and into the unit - then park wherever you can. There are disabled spaces, but not many. Just a head's up. Even if you have to park a bit away, its not a far walk and folks will move their cars here and there so you can grab a closer spot. I'll definitely stay again. Thx!! Fantastic location, surprisingly quiet, more square footage than any hotel, all amenities provided. This is the best value on the peninsula. Rooms are clean, manager is incredibly responsive. ONLY complaint was that I hadn't received the key code by the time I was supposed to check in (resolved within five minutes) and the wireless instructions were a little unclear (one more call solved that just as quickly). This is my go-to anytime I visit the area. We saw deer in the grass just off the lawn. The sunsets were amazing. The beach is easy access and easy to walk on. The unit was well stocked with kitchenware, towels, and linens. There were rinse off stations available in the complex for cleaning up from beach time. Not only was the unit pretty friendly but the condo community was pet accepting. I would rent this unit again. Thank you so much for your kind words — glad you enjoyed your stay! You're welcome back anytime! the condo was conveniently located, clean, but needed a little updating (sofa/large view window). The carpet did have some wet spots on our arrival...all-n-all we'll stay again! Had a wonderful stay in this quiet, cozy condo. Loved the location, just steps to the beach. Would definitely return. Our cancellation policy is a 48-hour notice, and 20 percent of the total rental price. If you stay is one week or longer, a cleaning fee of $100 will be charge. We ask for a 20% deposit for rentals two months or more in the future. For example, if you make a reservation in May for August and the total cost is $200, we request $20 for a deposit in May, with the remaining amount to be due a month before your reservation.